Forget about baseball jerseys worn by Babe Ruth. Or photos signed by James Dean. The hottest item on the collectibles market these days may be a Pope Francis autograph. Or, better yet, a Pope Francis-worn skullcap. As the popular pontiff prepares for his first tour of the U.S., collectors and sellers of religious memorabilia are talking about the booming market for all things Francis, saying the pope is commanding attention from autograph and artifact seekers in a fashion more traditionally associated with athletes and movie stars. Bob Jones, a top dealer in papal collectibles based in Overland Park, Kan., says he’s sold two signed Francis photos for around $1,800. A third is currently listed on eBay for $2,350. “I believe his is the most valuable autograph of any living human being,” says Jones. Jones might be overstating matters: Signatures of Paul McCartney, Prince William and Fidel Castro have been known to sell for more than $2,500, according to U.K.-based Paul Fraser Collectibles, considered one of the world’s leading autograph specialists. But the fact that Paul Fraser Collectibles chose to include Francis on its recent index of the 40 most sought-after autographs is not insignificant. And that’s not factoring in the sky-high prices for extremely rare Francis items. 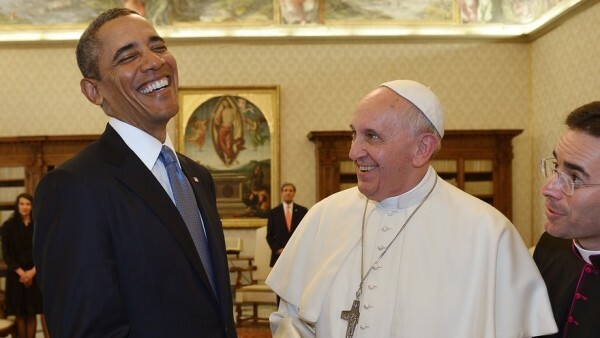 Pope Francis and President Obama at the Vatican. Earlier this year, a skullcap worn by the pontiff went for $113,210 on eBay, according to the justCollecting website. But that’s spare change compared with the price for a custom Harley-Davidson motorcycle presented to Francis—it sold for $325,904, according to justCollecting. Of course, if you just want a plain papal signature, you don’t have to spend anywhere near as much. Paul Fraser Collectibles says Francis signatures can be found for as little as around $230, citing a 2014 survey. But even that represents a 20% increase from previous year, says Paul Fraser Collectibles spokesman Dan Wade. What’s driving the value, say collectors, dealers and experts, is Francis’ surging popularity—a popularity rooted in his common-man appeal and willingness to mix with all kinds of people in all kinds of situations. Francis is also one of the first popes to readily sign autographs in public. (Others have tended to sign in private—and even then, they often did so only as a special favor or to honor a special request.) Francis has even been to known to sign the occasional cast of a worshiper nursing a broken bone. He’s not averse to scribbling his name on the occasional baseball, either: Father Richard Kunst, a pastor in Duluth, Minn., widely considered the world’s leading expert in papal artifacts, scored a Francis-signed ball earlier this year. “I was on cloud nine,” Father Kunst said at the time. And those lucky enough to get an autograph from the pope—much less a signed personal keepsake—aren’t likely to part with it easily. Papal autographs aren’t investment-grade collectibles so much as symbols of the faith, experts say. There’s also a realm of Francis collectible that has little to do with autographs (or motorcycles, for that matter). 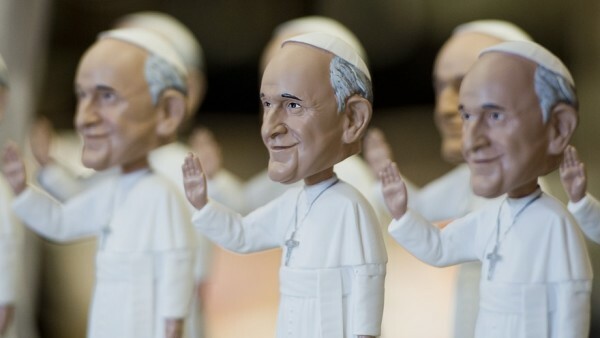 The U.S. papal visit has spurned a whole Francis industry, so to speak, with keepsakes ranging from Francis bobblehead dolls to holy water bottles. Ken Goldin, a leading memorabilia expert and founder of Goldin Auctions, advises against purchasing such items if the goal is to sell them for a profit a few years down the road. “If something is mass manufactured for the purpose of being a collectible, chances are it’s almost never going to be worth anything,” he says. On top of that, if you are looking for really valuable papal artifacts, you can probably do better than Francis, collecting experts and dealers say. Father Kunst says the most valuable item in his collection of more than 1,000 autographs, documents and other mementos is a signed letter from 16th-century Pope Pius V discussing the suppression of a religious order. He purchased it several years ago for around $800, but believes it could now easily sell for $40,000. In general, Father Kunst says that papal “letters of historical importance” have the most consistent value. But he also says items connected to popes with a particularly short tenure can be significant. In that regard, he’s working to procure an autograph of Pope John Paul, who had a tenure of just 33 days in 1978. As for Francis, Kunst believes the current collectible mania is unlikely to be sustained, and prices for signatures and other items will start to drop. He likens the situation with the current pope to the situation involving an icon of a different sort. “At one time, Britney Spears was the biggest thing in the world,” he says.